"A Nation, A People - Strong, Healthy, Proud and Self-Reliant." Click on the link to visit our new Facebook page! Want to receive Chalo news via email? Leave us your email and we'll connect with you there, too! 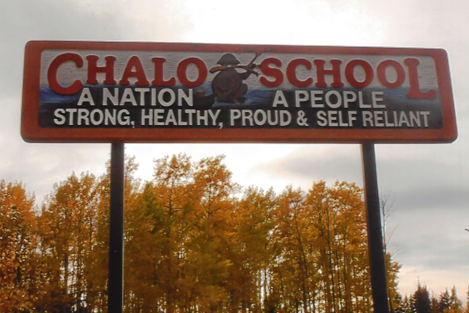 Welcome to the website of Chalo School, a school dedicated to providing an exemplary educational experience for each student with a First Nation perspective. A review of the website will enable you to quickly gain a sense of the energy and excitement that is associated with the learning that permeates Chalo School. From our website you will undoubtedly begin to construct an understanding that Chalo is a school dedicated to supporting and challenging each student to meet his/her full potential. The school has a rich and extended history of working with students to support their academic, emotional, physical, and social development. This is best done by everyone at Chalo School dedicating themselves to the application of “best practices” in facilitating the learning experiences of students. Three statements serve to emphasize what is at the heart of the day- to- day interaction with students at Chalo School. The above statements collectively contribute to the creation of a wonderful Chalo learning community for students, parents, staff, and administrators. The commitment to the “Vital Few”, in concert with the development of a strong home/school partnership, is the key to forging a working relationship focused on promoting student success throughout the school year. Strong, Healthy, Proud, and Self-Reliant. We expect our students to leave Chalo School equipped for future academic success and, just as importantly, to depart with the knowledge and skills needed to be successful world citizens. Our school has spectacular facilities, technology, and programs, but these are not our most precious resources. The people at Chalo - our students, our parents, and our staff - are the heart of Chalo School. Whether you are a family seeking to make a decision about the best school for your child or a current member of the Chalo learning community looking for specific information, you are invited to explore the pages of the website to learn more about what makes Chalo such a wonderful place for students between the ages of 3 and adult. We anticipate the information available on these pages will meet your needs, but if you have further questions, please do not hesitate to call 250-774-7651 or e-mail us at the addresses below. "Strong, healthy, proud and self-reliant." 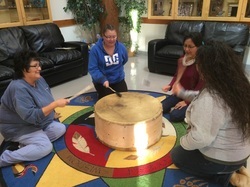 ​the cultures and languages of the people of the Fort Nelson First Nation."